Millions are making the switch to thermoplastic for their sealing needs. Are you ready to make the switch from rubber to TPE for your seal, but you’re not quite sure what you need to consider? Use this guide as your starting point. Simply fill out the form below and we’ll send a link to your inbox immediately! How is TPE different from rubber? Why would I want to switch to TPE in my application? Will TPE even work for my seal? What TPE compounds do I have to choose from? What are the nuances and practicalities of retrofitting my current design to a TPE? Yep – we were there once, too. And we know how difficult it can be to champion change. That’s why we created this guide. 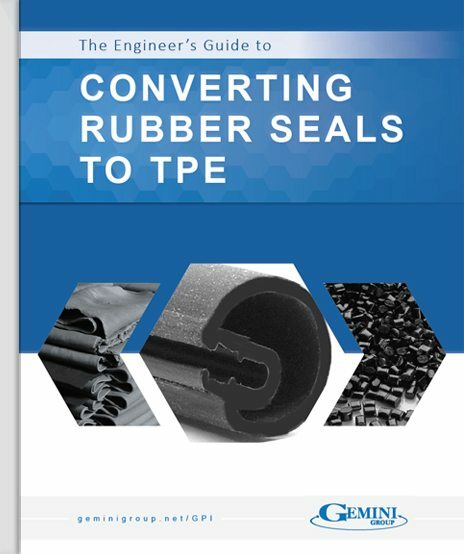 It provides the basic guidelines for converting rubber seals and weather stripping to TPE – all from the perspective of an experienced seal engineer. This is not an exhaustive guide; the amount of information available is simply too great. However, it serves as a starting point to better understand TPE’s and what you should consider when designing with them. Gemini has spent decades developing over 5,000 extrusion profiles and manufacturing millions of dual- and tri- durometer seals. You can be confident that we have the resources and expertise to help with your unique application. This guide truly is the next best thing to working directly with our seals team, so what are you waiting for? Dive in!